An arcade racing game inspired by the classics from the turn of 1980s and 1990s, as well as the improved version of Night Riders, which was released e.g. for mobile devices and PlayStation Vita portable console. Super Night Riders is an arcade racing game inspired by classics from the turn of the 80s and 90s of the last century. The production is an improved version of Night Riders, previously released on mobile devices and the PlayStation Vita mobile console, and is the responsibility of a one-person, independent studio neko.works from France. 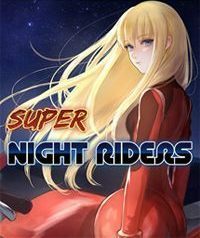 In Super Night Riders we play the role of a talented, light-haired motorcyclist named Alice, known under the pseudonym "red rider". The production is devoid of the classic storyline and focuses mainly on the next races, modelled on the classic representatives of the genre like Super Hang-On or the Outrun series. Fun mechanics combines the features of typical races with the elements of modern, casual endless runner production. In the game neko.works the position at the finish line does not matter, and while having fun we just have to get as far as possible, avoiding the rivals' motorcycles passing by on the way. The only goal is to pass the checkpoints before the mercilessly passing time. However, in order to avoid the monotony typical of endless runners, players have six different routes at their disposal, divided into 36 special sections. Super Night Riders was created on the popular Unity engine and features three-dimensional but minimalist graphics that can evoke associations with the arcade of a quarter of a century ago. Compared to the mobile prototype, however, there are a bit more details on the routes (although built of a small number of training ground), as well as the ability to ride at night.